The efficacy of a dietary supplement largely depends on the manner in which it is delivered to the body. This is especially true for probiotics, which present the added complication of consisting of bacterial organisms that need to be kept alive. This is the case not only all the way through processing and storage, but also post ingestion so that they can actually reach the part of the digestive tract where they can exert their attributed health benefits. 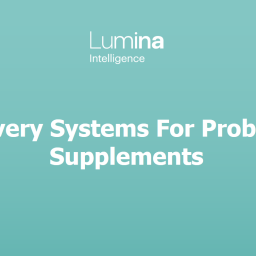 This article identifies the main probiotic delivery systems marketed by the leading brands across 20 countries, as identified by Lumina Intelligence Market Research. It draws attention to the curious fact that most brands make no mention of this important technical aspect in their communication with the consumer. Why aren’t brands marketing their delivery systems? The digestive process is not amenable to life. Digestive enzymes, which are designed to disassemble our food into its basic constituents, already start acting in the mouth. The stomach continues the work by creating a highly acidic environment. As the contents enter into the small intestine, bile salts pose yet another major obstacle to probiotics’ survival. In fact, besides breaking down our food, so that it can be absorbed by the body, the digestive system’s other main job is to neutralise potentially pathogenic bacteria. The cumulative onslaught of the digestive juice cocktail, however, is rather a sledgehammer approach that does not distinguish between friend and foe. 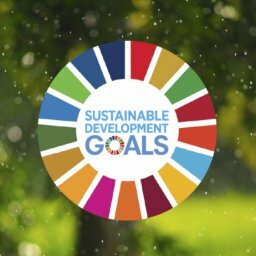 Potentially beneficial organisms are eliminated with the same efficiency as disease-causing ones. The challenge for probiotic supplement brands is clear: To protect the organisms in such a way that sufficient numbers of them are able to reach the precise part or parts of the intestine where conditions (in terms of acidity and the presence of oxygen, etc.) allow for colonisation. With this objective in mind, industry employs a range of different delivery systems, the most widely used of which are illustrated in Figure 1 below. 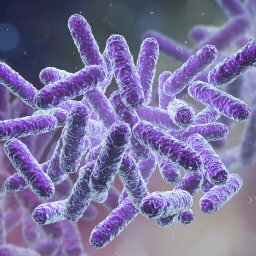 Our research, which has captured and analysed the top-selling probiotic product brands and brand variants across 20 markets worldwide, identified BIO-tract as the delivery system that was most often mentioned in the product description, appearing on just over 11% of the probiotic products. According to Nutraceutix (now part of Probi), the developer of BIO-tract, its delivery system offers protection from the aggressively acidic environment of the stomach. This means the live organisms are released further down into the upper and lower intestinal tract for a sustained release over the course of up to 18 hours. This time span is long enough for organisms to travel along the entire length of the human gut, making BIO-tract technology potentially future-proof. Microbiome research is bound to keep on advancing and – with the discovery of more strains of probiotic bacteria, their health benefits and preferred environments within the human digestive tract – BIO-tract technology should be able to get them there. 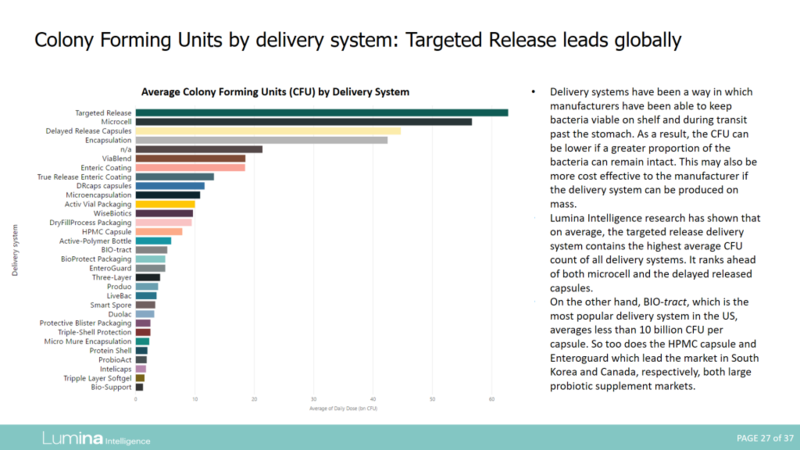 Microencapsulation of probiotics for gastrointestinal delivery is mentioned on just over 9% of products that make reference to a delivery system. This a process in which the bacteria are incorporated into an encapsulating matrix or a membrane that protects the cells from being obliterated by digestive juices and allows for the release of the live bacteria at a controlled rate. 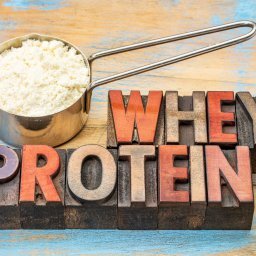 Delivery systems, which encapsulate probiotics, are typically made from alginates, proteins or gums, such as xanthan gum. 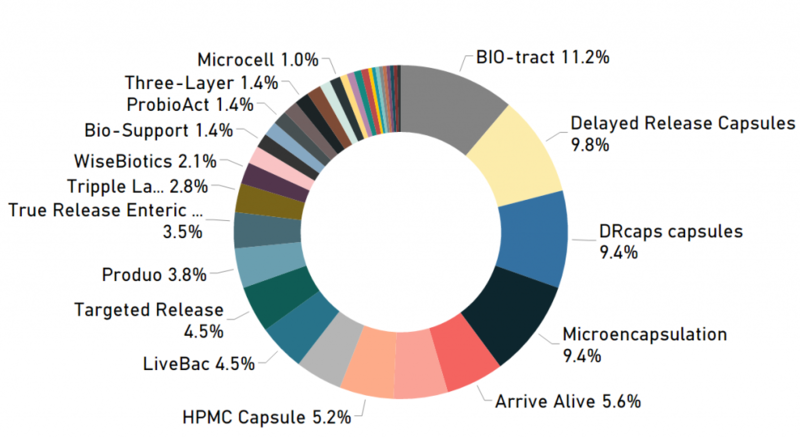 HPMC (hydroxypropyl methylcellulose) capsule shells and coatings delay the disintegration of capsules and thereby ensure a higher survival rate of probiotic bacteria making their way through the human digestive system. These are progressively replacing tablets, chewables and gelatin capsules in dietary supplements. The HPMC polymer’s key advantage is that it is a plant-based material – an increasingly important characteristic in the modern market environment with “vegan” claims abound. 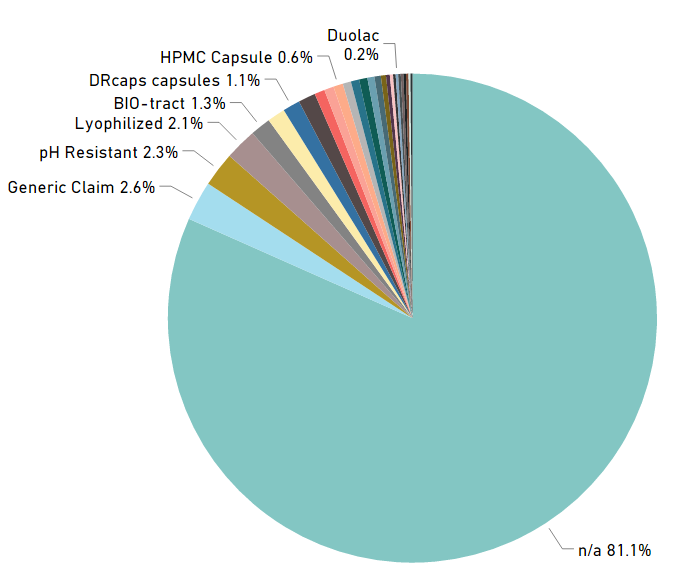 There are a number of delivery systems that utilise HPMC, one of which is DRcaps by Lonza’s Capsugel – used by over 9% of named probiotic delivery systems globally. Novel delivery systems designed to boost the survival rate of probiotics during intestinal transit are being developed constantly. For example, UK-based Symprove markets its patented UDS (Unique Delivery System) for a range of drinkable probiotic products aimed at people suffering from irritable bowel syndrome (IBS) and irritable bowel disease (IBD). According to the company, the product’s water-based formulation allows the bacteria to pass straight through the stomach without activating the digestive process. 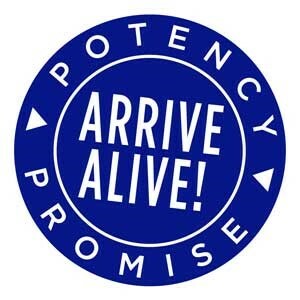 The fact that only around one fifth of probiotic products explicitly promote using a specialised delivery system can only indicate that most brands consider this information as either “too technical” or simply not relevant to the consumer group they are targeting. It is worth pointing out that there are marked differences between countries, as our research has revealed. While in markets like China, Japan, Spain and Poland there is virtually no mention of delivery systems at all, in South Korea and the US 39% of brands did carry this information, as did a third of the captured brands sold in France and Finland. The US has the largest market for probiotic supplements by far, and it was one of the first countries to actively market the use of delivery systems to consumers. The country racked up the largest range of probiotic supplements in terms of count as well as the greatest variety of delivery systems named on pack. This hints at a comparatively high consumer awareness of the advantages that such capsule technologies can bring in terms of product efficacy. As the probiotic supplement market becomes more competitive, delivery systems will be used ever more assertively by brands as a tool for adding value and differentiating their product from the competition. Consumer education is, of course, a vital part of the process. Brands nowadays – with the help of mobile technology, ubiquitous wifi and apps – stand to benefit from the fact that it is easier than ever before for consumers to research dietary supplements and their distinguishing features. In the long run, any brand that neglects to integrate an effective and targeted delivery system for their probiotics and/or fails to communicate this to the consumer, risks to be eliminated early on from consumers’ shortlists of possible products to buy. This article is based on a report available to Lumina Intelligence Probiotics subscribers. “Delivery Systems for Probiotic Supplements” focuses on delivery of viable organisms to optimal locations in the body as, over the last decade, viability during manufacture and viability during time on the shelf has been overcome reasonably well by manufactures in the supplement marketplace.